I was off again early morning travel at the train station, but my frist band road trip in Japan. As stated my Matsuo-san, this is done Japanese style via train not van, or bus. I was to met up with Matsuo-san at a few stations up the line from me, from there we would travel together to Kyoto , there we meet up with everyone else. Train trip was uneventful, we chatted a bit and caught up on my sailing reports with I am late with. Oh well, it is the holidays and I am American at times when I need to use my gaijin card. We arrived and found our way to where we needed to be. We were surprised the weather was good. There was a lot snow a week or so ago. On our visit we only saw one left over unmelted pile and a lot in the far mountains. One of my favorite places to see it, from afar. We went to the venue, there checked in and did a song for a sound check. The sound system was very helpful high-tech. A nice setup. Next stop was to locate our hotel. 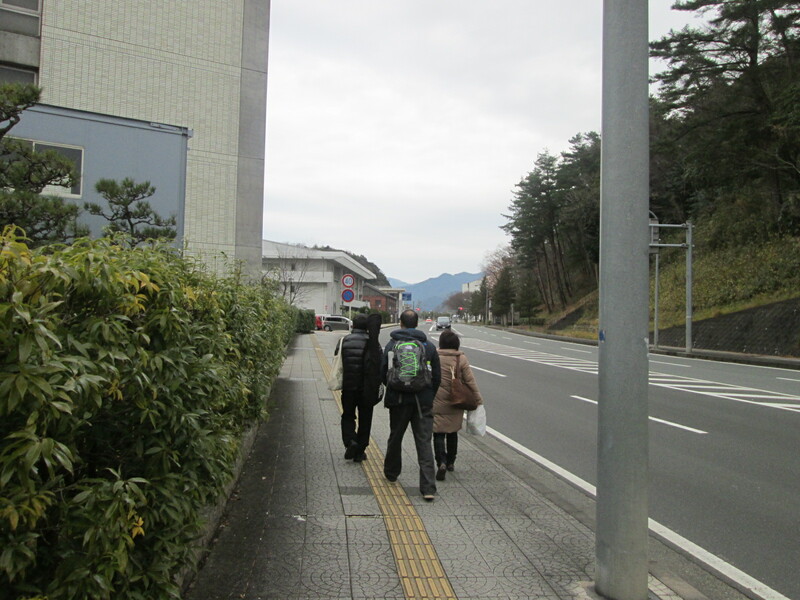 We set out on foot after getting direction from the information station after we had lunch. Lunch was tricky for me. Nothing really for me to eat. I ordered a salad. I got this little tiny smaller than MacDonald’s salad. Ehhhh?! Once I saw it I order another. Still not much for filling, but I figured I would make due until the rumored dinner that was later. So we head out to the hotel. It was not a bad walk about 10 min more or less. We went through check in. A taxi was ordered for me in the morning as I needed to leave earlier than everyone. I had to be back in time to lead my Chan class. We went to our rooms. The drummer was concerned that my room was much smaller than his, but at the same price. He offered to switch with me, I said no way, why? It is just me sleeping. Ok, we head back to the venue there is still over an hour before we go one, but better to be there. We head back an easy walk and sit to watch a couple of the bands. Finally it is our turn. Thing we well-organized we setup and went on. The first song went better than thought, after a discussion on what to play, a band already did a couple of song we had planned. We decide to drop one but still do another. First song went well. Second song, one Bass string was out of tune suddenLy, I had to tune while playing a song. yuk, I hate when that happens. Next song was so so. As where the rest. Drummer messed up a few times with the beat, guitarest mess up a few times as did I. Oh well. Overall it was good. We shpuld have shorten the songs for this venue. We are used to playing ina bar and jam so tend to stretch songs, more than needed in this venue. Oh well, lessons learned on our dime. .once we finished our set another band started to set up for their part. They were the last band of the show, the heavy hitters. I heard someone say, let’s not do blah blah song. It was the one we just finished with, so other groups had the same issue, not repeating a song. We did one, but i think it was ok ,as it was a gospel group separating us and the way we did it was arranged different. Once we got off the stage the photographer wanted to take our photo. We agreed. We also got individual shots done. He was good! I also found out later a picture he shot while on stage, was used for a poster he made. Afterward we hung out. Took a group photo. Many went home. We stayed on since the drummer is friends with the host. I did not really have much to say. Just watched and listened. As it turned out there was no dinner, at least right away. There was snacks and non-alcohol beer…I hate beer taste… and passed. By the time folks were ready to find a place for dinner, it was too late for me. Also I was full enough from the chip snacks, I choose as did the guitarist to go back to the hotel for a hot bath and relax. After some insistence we headed out in the surprise rain for the hotel. We were given abandoned umbrellas left in the racks, by forgetful people. We walked mostly protected back and checked in, for the night. The trip home for me was fairly easy and interesting. I had a local train for an hour. Then changed to an express with reserved seat. That was nice. I fell asleep hard near the end that leg. I missed my station. I woke up with new not enough time to gather my stuff. Therefore I rode to the next stop and went back. I lost about 30 min, and it cost no extra money, so since I was fairly early it was not a big deal. I made my needed train exchanges and made it home with enough time to eat, change clothes and go to my Chan class. It was a fairly ok trip, nothing really that interesting, and not as much fun as hoped for, still ok. We are asked back in the summer for another show. Maybe interesting, planned better with no need to rush home, and take LZ, for a outing. So we got some pictures , new connections, a change of venue, advise out of the deal, also a invite to return in July. Here is a song from the show. Happy New Year everyone, catch on you on the flip side . It was my plan since I had the time and opportunity to go to the Kyudojo that I would do the New Year 108 ya shoot there, instead of at home on the 31st. I figured it would not be crowded so I could just settle in and do my thing. Wrong!! It was the last day the dojo was open so it turned out that a lot of people wanted to get their last shots for the year. It was crowded. I was surprised to see even the Kaicho. Even turned out I got a lesson. I need to relax at Hanari. I tend to force my release I was told, instead of relaxing into it. Small point but one of those easy to understand , but difficult to do. Reminds me of Tai Chi Chuan strike, one needs to be relaxed but still deliver power, by using the body and legs. 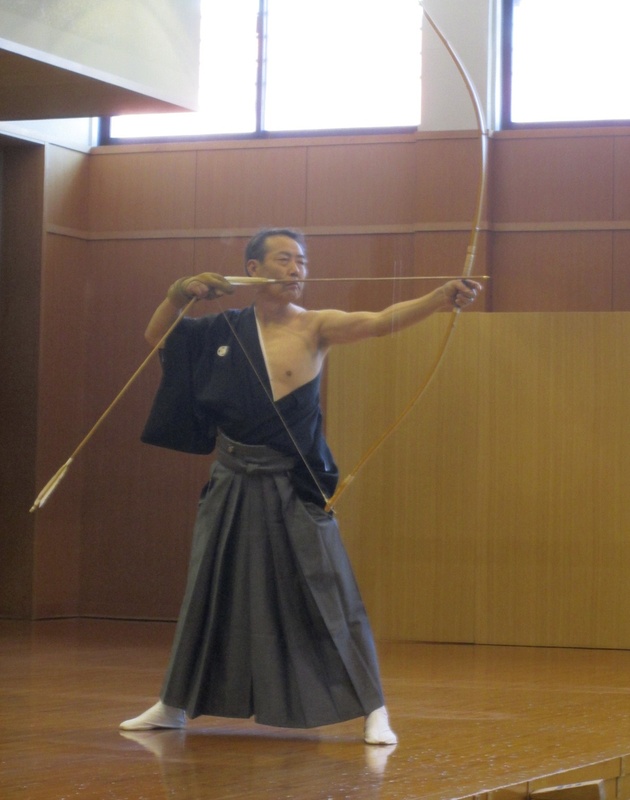 So with Kyudo a good ground, use one’s body with the strength of the bow. Something good and worthwhile point to keep in mind. So as it happens there is a note on the bulletin board that says these ( pointing with an arrow) papers attached are for me. The Kaicho gives it to me, it take me a moment to click in my head I am reading English. It is the paperwork for the Asian-Oceanic Kyudo Seminar in April. I am reading it through and am asked what it is by a couple of sempai. Since it was in English no one know what it was. I explained. After some discussion I am asked, are you going? why are you going so far, you can learn here. You are one of us! I was touched. Not their exact words but is what it all meant. Considering all, the cost, travel, timing, and that the shinsa is on my wedding anniversary it is most likely. Not a wise trip this year, at least to participate. I will do my Shinsa in Osaka. I would like to go to Nagoya to met a couple of people, but…hmm I see how the flow of the Force goes. There was something that I did that cause a bit of a commotion during practice. I was using my iPad Kyudo app to track my shots and score for the day. Several found that most interesting, so much so they looked for one for their Phones and downloaded it on the spot. I was tickle seeing their excitement. Even an elder Sensei who has that stern quality about him, remarked he had gotten it smiled and did the thumbs up. The day practice was good, I am glad I went. I still need to do the year-end 108 shot, but I will do it at the Bamboo Mantis Hidden Makiwara Dojo as planned. No line, no waiting, no long walk to recover arrows, simple. 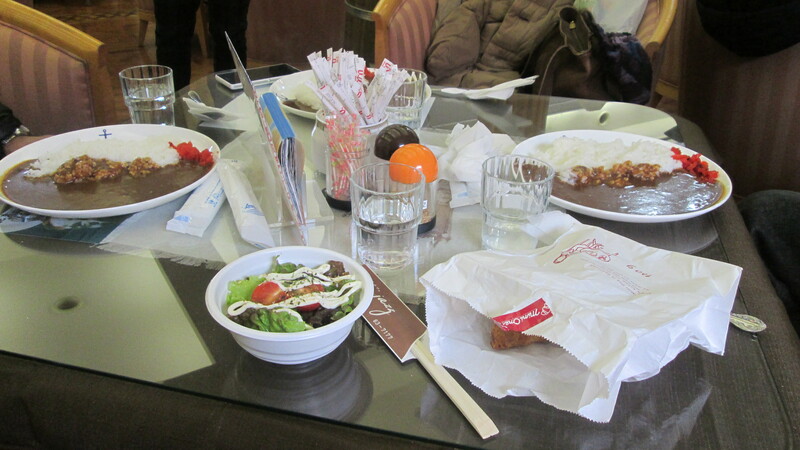 Easy break, time with hot tea, sake, and a snack. Good way to end 2014, close with some meditation, incense and prayer. Alone but not alone. So it seems that we, the band, are booked as a regular monthly band. Just what I was hoping for as a minimum doing music in Japan. So that aspect has worked-out perfect as hoped for. Even nicer the lads in the band are cool. Many times there is one jerk, pain n the rear type. We had a rehearsal last Friday to go through some new songs and a some practice on a few old ones. We have a couple things upcoming, the Tuesday (now past) gig at Chicago Rock B&S Bar. 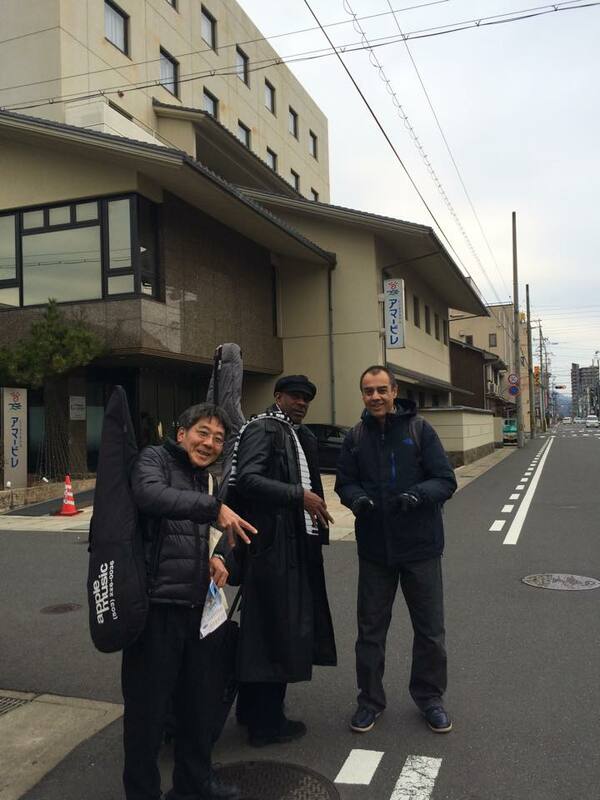 The following Sunday (upcoming) a guest spot at a Blues and Soul show in Kyoto. It will take some travel and effort to get there and we want to make a good impression. So the Tues @ Chicago Rock was fun. It was a long day for me as I worked the day. I had a sailing class to teach. Yeah, I was surprised also to teach this late in the year. Even more so when I found out I have another class in January. January teaching a sailing class in Osaka! Maybe the force will bless me with another good day. Tuesday was not bad, fairly mild temps, I dressed warm, and there was mild wind. This past week was ridiculously windy. This day was good. The person spoke some English which always helps things go smoother. Oh, and no rain! Unlike the past week class where one day of the two-day class was filled with rain and high wind. Even so the class must go on, when unpleasant. I worked around it as much as possible, but did need to spend a time in the rain as the winds abated enough to make some docking training feasible. Afterward I head to meet up with the lads in the band at the club. I had made arrangements to get done with class early, so I could make the gig. As it turns out I had plenty of time. Enough that I could stop and eat a bowl of noddle at a shop. Kisune Udon. From there I went to the club. Still I was the first to arrive. So I hung out bit. Even when the guys got there the owner was still some 20 min away. The lads went and ate. I hung out with the equipment and played with a few selfie photo shots. Once we had all setup, a friend from the Mosrite club cane and sat-in with us for the night. It was fun. Also nice to have another instrument to fill out the sound. I got a surprise that the guy and I could match our vocals easy. It was nice to have a fuller vocal sound as well. The club was not busy so we got to be very casual with our song list and playing. It was a good evening. The one bummer is I thought it was taping audio but nothing recorded. My bad for not checking in detail other than a glance. Oh well. Non-attachment…the memory is there. If we all live there will be other times, If we stay local. So here it is Christmas 2014. It is a much better Christmas for us this year. LZ is off, unlike last year and has the energy to cook. We are having some quiet time, dinner relaxing being grateful. The wine helps. Merry Christmas / Merry Festivus From the Zen Clan. I have a two-hour train ride ahead of me ( which turned out to be 2.5 hrs), so I have my trusty old fading-out with age battery iTouch/pod with me. Starting this post whilst on the move. This gives me a little something to do whilst traveling. Very little right now so I will play some computer “GO” whilst on the go after I type a bit. Next stop Banpaku Kyudojo. A little nervous, having not been there in over a year. Aug ‘ 2013 before the passing of Sensei. I am not expecting anyone to remember me except for one Sempai, if she is there. I hope so as I have a group gift and pictures, she can give them to the group. Not that any of that really matters, the remembering me part, as I know the routine for shooting and the like. It is just easier than explaining my history in my poor Japanese. I had written to another Sempai who still trains there from time to time. Alas he is busy elsewhere so can not met me. Perhaps at the first shooting of the year at Osaka Castle, he said. Anyway part of this being a pilgrimage is, it is my first trip this far in Osaka alone. So far I have changed trains 4 times and have two more to go which are monorail, before walking several blocks to the Dojo. 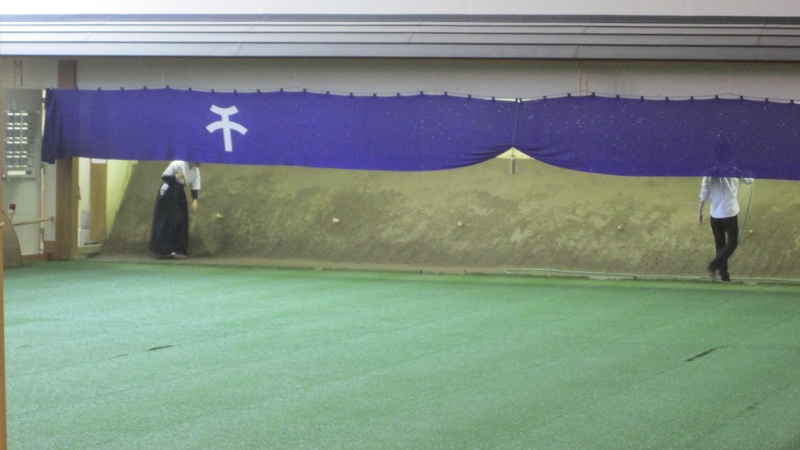 The Dojo is located in a city park, recreation center complex, near the Expo, monorail station. A pretty straight shot ( heheheh) once one clears the complex grounds. It is done, now on the way home. I got there with no problem with the trains or monorail. However once there walking to the Dojo I missed it, kind of hard to see anyway. Not a big deal I just back tracked some and it was all good. The problem is the street splits a bit and I was on the wrong path. No matter I got there and it only took a few minutes to correct. So when I arrived the first person I saw at the entrance was the Sempai I wanted to see. Perfect, it was a good sign. She remembered me of course, not that many Americans of color roll through there. She helped me check in and we chatted a bit. It turns out her English is better than I thought. She had spent a year in Mich. I gave her the candy for the group and pictures of Sensei she took care of the rest. A couple of people remembered me, everyone was nice and welcoming. Those that did not know me once Nogami Sensei’s name was said with mine as a student, were also very welcoming. I first went in the makiwara section to warmup and work on my draw. After a while the Sempai came and asked if I was only going to do Makiwara. I said, after a bit of warmup I will do mato. She said ok, please join us when you are ready. So after a short while of several ya, I went into the main hall. It was chilly, but there was a couple of heaters going and a heated carpet, nice. The rain had stopped, kind of a bummer, I think it would have been cool to shoot through the rain, watching it fall. So another older Sempai asks me if I could do Tai Hai with a group of five and what is my Dan. I said yes and gave my rank. She gathered a group to shoot which included a couple of Sensei. 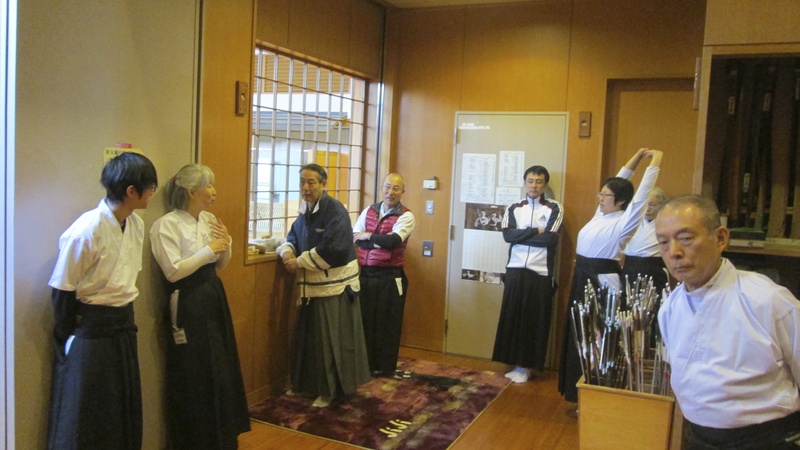 It seemed like I was being checked out as a couple of other Sensei took a spot on the “platform” and a couple of other Sempai sat there as well. I noticed that the candy and pictures I brought where also there were Nogami Sensei would sit. It kind of pleased me. 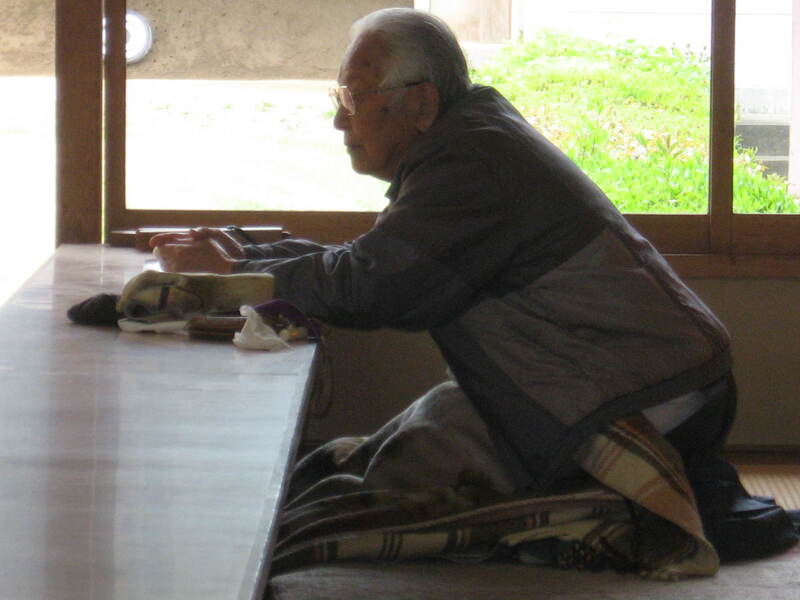 Reminded me of offering, leaving out fruit and sake with the picture of Otosan Miyatani. 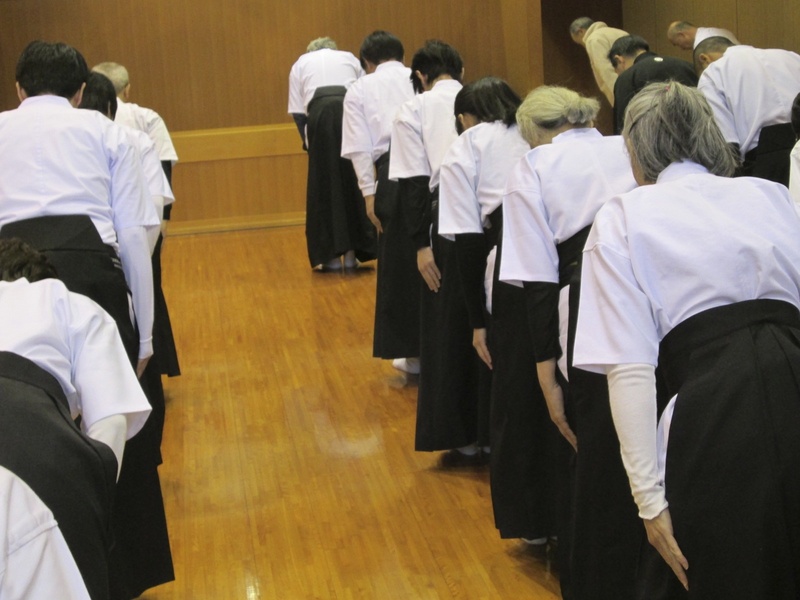 With that there and doing a full Tai Hai with some of the Sensei it was like doing a ceremony for Sensei. I was asked if second position was ok. No problem I said. We lined up and entered. I made mental notes of all I was supposed to do and had learned. I kind of felt like Sensei was there. I felt his memory strong. It went off without any problems, I even hit both shots, the first dead center the second off to the edge. Still aww yeah, representing! Sensei would have been please, I was! On a couple of levels. So a few more shots, than I was invited to join everyone for tea and cakes. 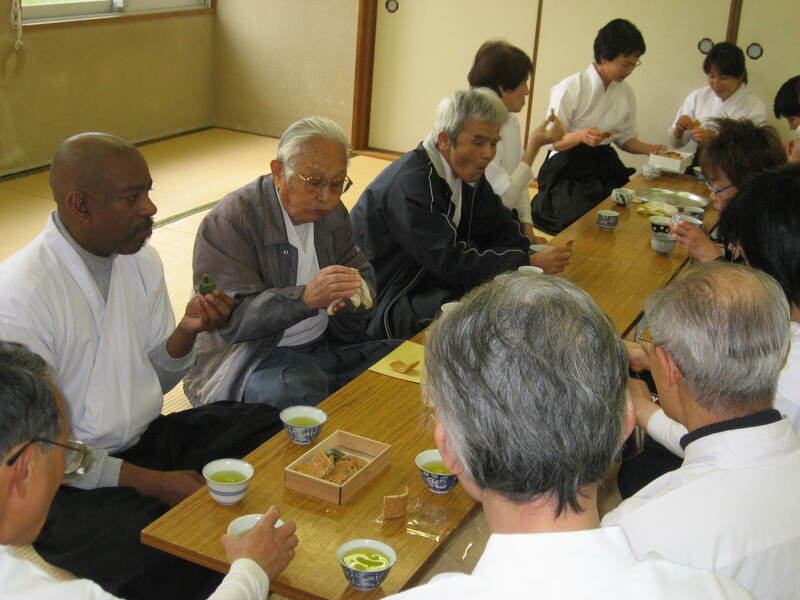 This is one of the things I enjoy about this Dojo is the group tea time. 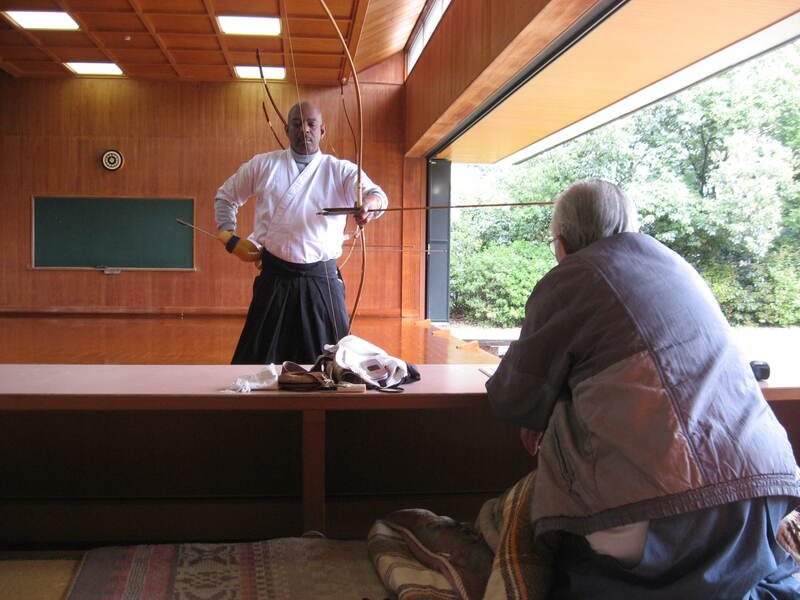 I do not understand what the conversations are about, but the vibe is good, it reminds me of the Pasadena Kyudo school and at time the Berkeley school. It brought back good memories the whole experience sitting there with Sensei. I noticed several of the students look fondly and a bit sad at the pictures of Sensei I gave them with the candy. It was a long trip but worth it to my spirit to pay my respects to Sensei’s memory. I will go again next year and spend the day in practice not just for a couple of hours like today. It is comfortable knowing I am still welcome. Still it was a good worthwhile day trip, I felt Sensei was pleased. Once upon a time, back in the day when I was still an innocent infant to Kyudo, before I learned about the factions, the separations, the politics ( people always got to be trippn). At that time I thought Kyudo was Kyudo, everyone was one big family, just a matter of family style ( Shamen, Shomen ) made the difference. I was a student of the Shibata style at the time. 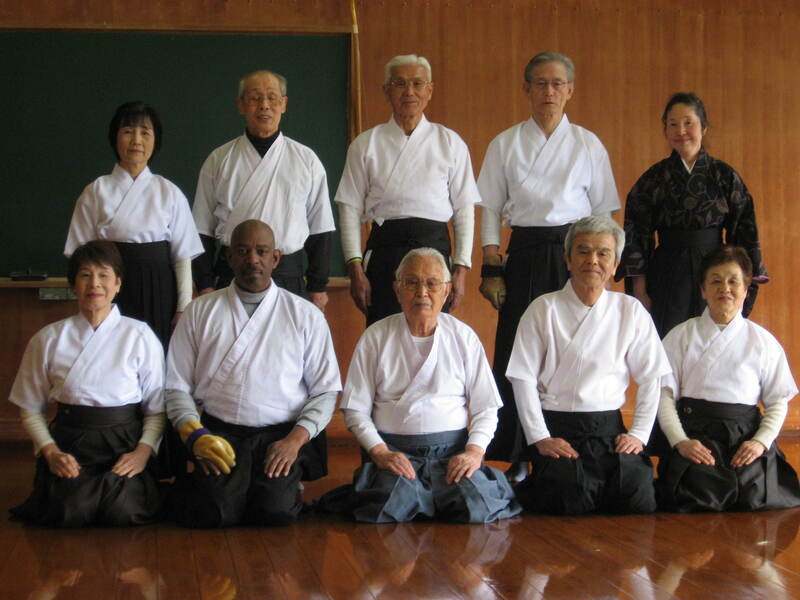 I had heard that in order to practice with a group or DoJo in Japan I needed to be qualified with a group/style in Japan. Shibata Sensei’s style in the States was not. 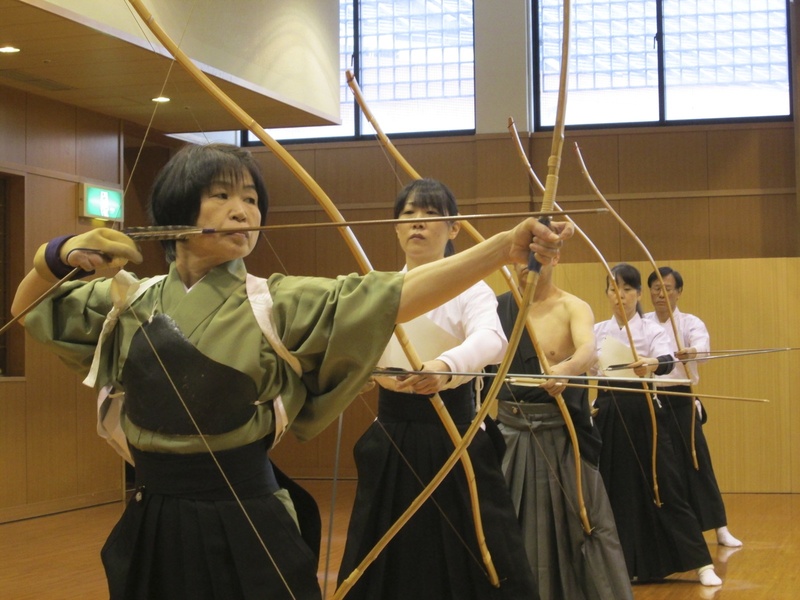 As I had plans to move to Japan with my wife, I needed to research Kyudo in Japan…Osaka, Japan. 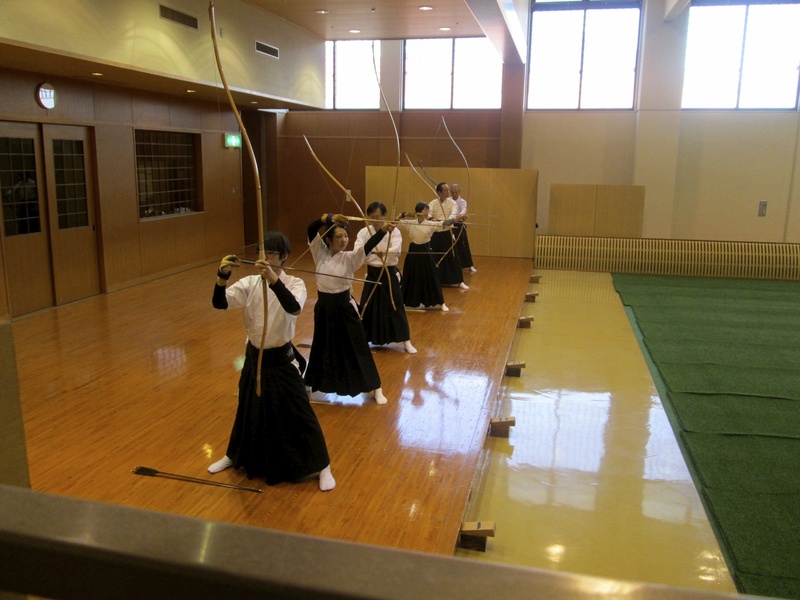 I took my first trip to study Kyudo whilst in Japan visiting with family. I made a visit to a local Dojo. 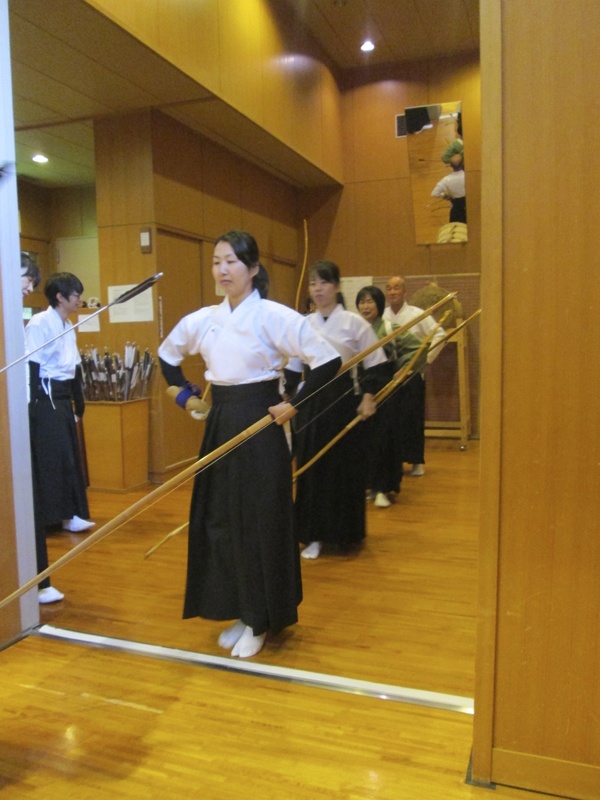 I was told since I had some small amount of training I could come in and shoot the Makiwara. However the master was due in that day and I would need to get clearance from him. There were many Godans, Renshi and Kyoshi there that day to practice with him, so his approval was needed. 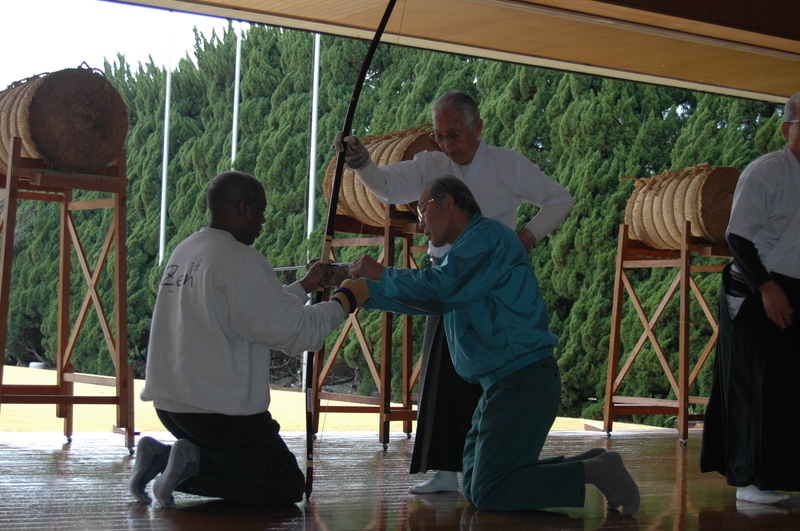 The master was Nogami Sensei Hanshi Hashidan. I was told where to change and to wait. Nogami Sensei arrived and after changing he spoke with me via my wife who translated. After a bit of introduction and chatting the Master showed me how to wear and tie the Yugaki. He then worked with me some on Tenouchi, entering the Dojo and some other basics. I felt like a bumpkin, most of what I had done so far in training was way different, wrong, or not there. Kind of embarrassing really. I just rolled with it and listened carefully. One learns more by listening than by making excuses. He spent about 1 hour with me. Then excused himself to work with his class and had me practice. 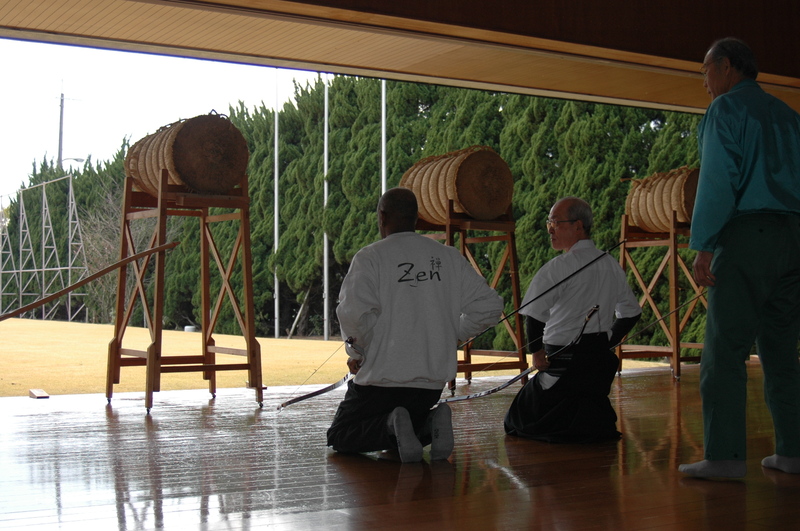 A short while later he sent over a student of his who turns out to be a Kyoshi, who worked with me for another 30 min. We then receive word the master wanted to see us. He had arranged for the students to give a demo and invited me to sit with him while he explained what was being done. Afterwards everyone went into the break-room where we had tea and cakes. Needless to say I was quite shocked by all this as I only thought I would be shooting Makiwara for an hour then leave. After tea the master again worked with me some before again having another of his students, another Sensei practice with me. All in all I was at the Dojo for 4 hours, watching, practicing, listening, amazed. Over the next few years I stayed in touch and visited, trained, was advised and corrected when in Japan. When I returned last year to Japan as a new resident he was delighted to see me. 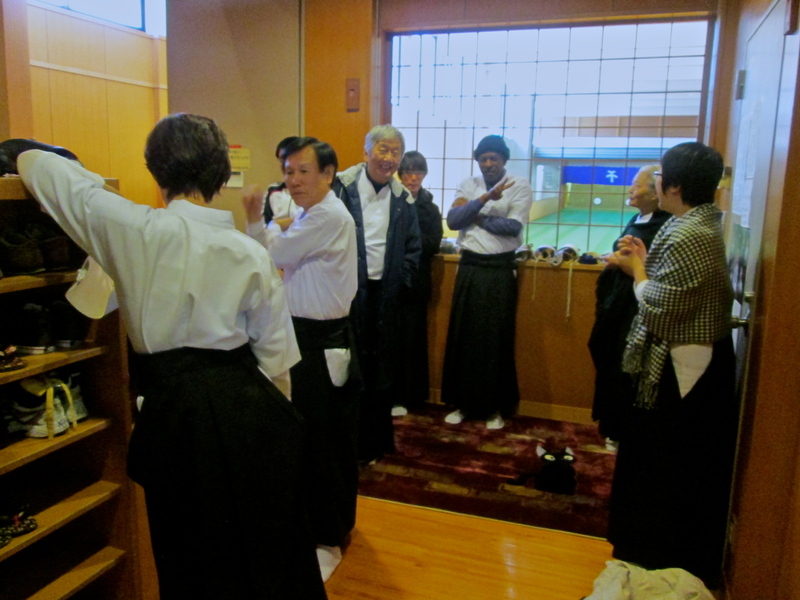 I was introduced to everyone again, students, sensei’s, and the dojo Kaicho. 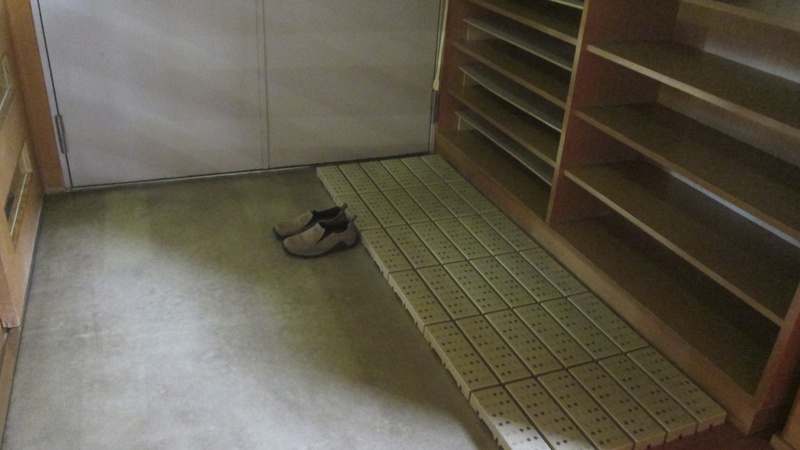 Sensei had been seriously sick and was just returning to the Dojo at this time. He was not shooting but he was still guiding the students. I informed him I would be moving to another area of Osaka and couldn’t attend this dojo easily. I asked for a suggestion on where to attend. He gave me his home phone and said he would make some calls on my behalf. After a short time later I was told he had spoken with a Kyoshi about me and I should look him up. This person Yamashita Sensei gives lectures at Osaka castle Kyodojo and often travels to New Zealand and Australia to give seminars. I was delighted and grateful. A short time later before I had a chance to speak with this Sensei in person, he calls me to say Nogami Sensei had passed away. Few people knew of it mostly family. Otherwise it was kept low-key. He felt I should know. 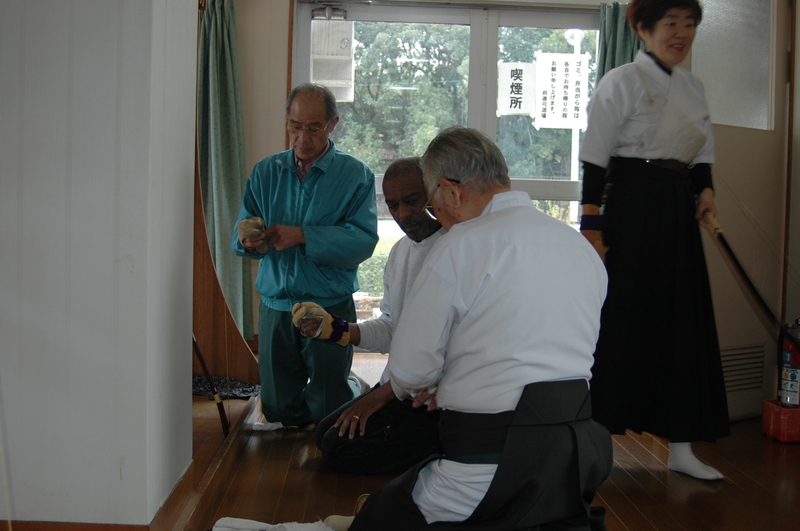 I am forever grateful to Nogami Sensei for his help and kindness. In two days I am making the first of my annual memorial pilgrimage to my old Dojo to practice in Honor of Sensei’s 1 yr “passing-on” anniversary, which will be this coming Sunday. I say a pilgrimage because it will be a 2-hour train ride to get to the Dojo. 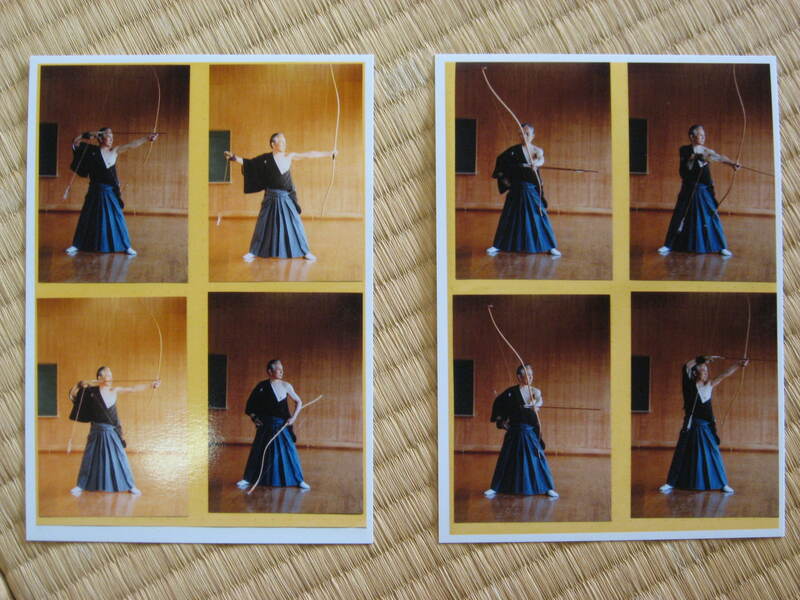 Now I have two personal Kyudo “quest” a year. 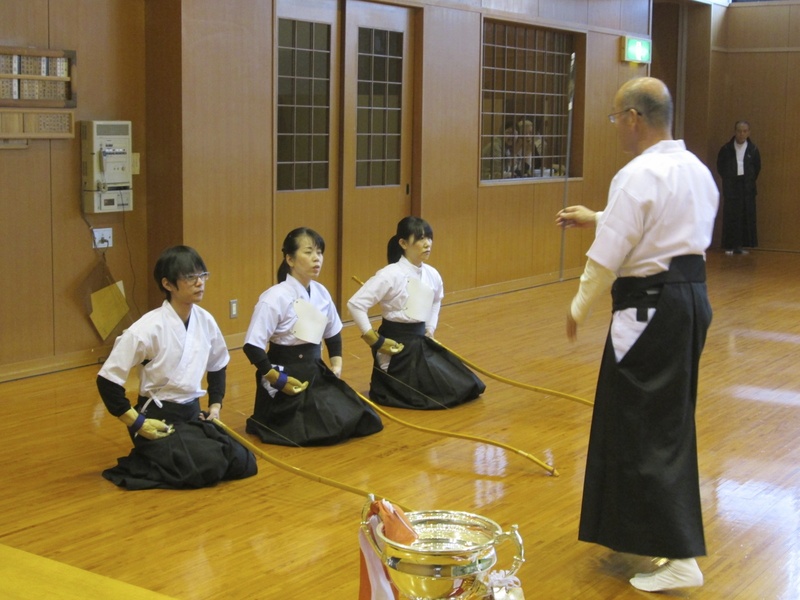 The “New Year 108 Arrow shoot” ( based on the 108 Buddhist bell ringing practice), and the “Annual Nogami Sensei Memorial Kyudo Pilgrimage”. R.I.P. Nogami Sensei arigatou gozaimashita. The weather has been cold and very windy as of late. Today I wrapped up like what people do in the winter and go out, and walked to the train station. 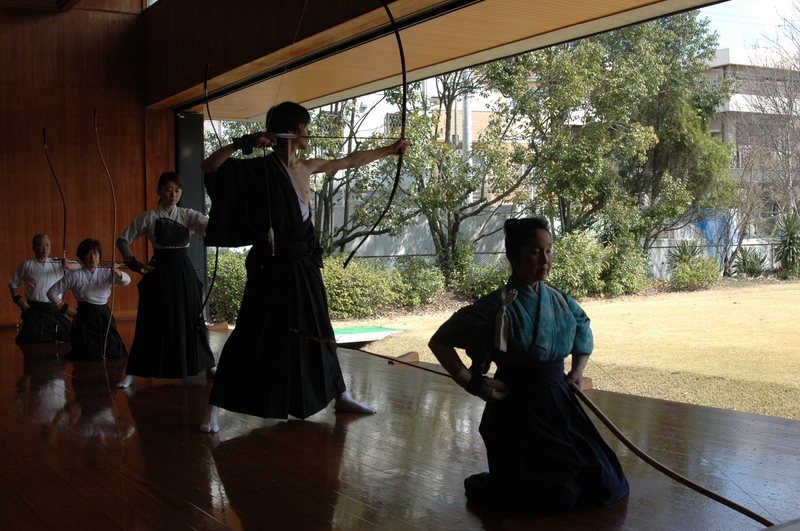 I was off to Kyudo the end of the year Kai. I was expecting a fair amount of people. However it was to me on the small side for a turn out. However it did not dampen the event at all. I was second of two people there early, way early! The other person left as was coming in. She said somethings about us being early and some other stuff then left. I was alone. 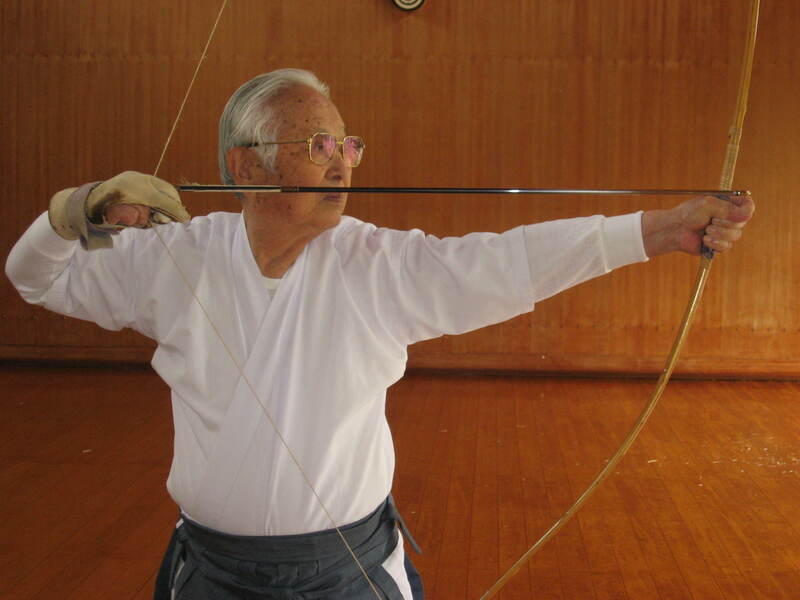 A plan was born, I would change to my Kyudo gear then, do some Tai Chi on the side. Man plans, Heaven ordains. That plan quickly faded as some people showed up and started to clean even before I finished changing. No matter, those who adapt survive. I changed and did some warm-up stretching as little by little peoples started to trickle in. Soon it was time to start. They did some opening announcements, of which I had no idea what was being said, and did not really matter. 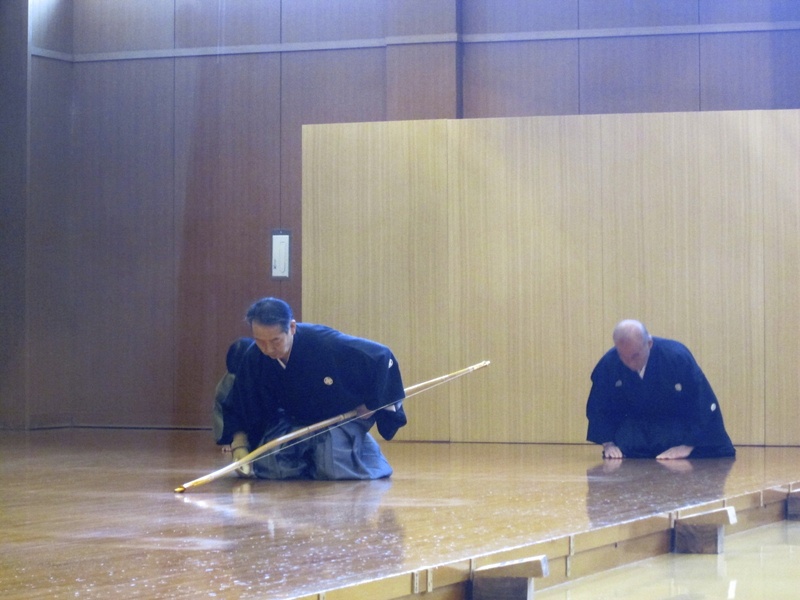 Afterward we bowed in and the day-kai began. First came Watase Sensei doing a opening sharei. My shooting performance was not great but I did make one hit each set of four. I am still figuring my targeting and also working with some new positioning I was told by the Kaicho from the last session. Bringing my elbow higher and back more. It feels like I am bring my elbow behind my head but, looking in the mirror I am not. Also standing more upright. This also feels different like I am almost going to lean back but really it just brings me straighter. Also I have changed my targeting. I notice most of my shots go lower right corner outside of the mato. I see that the new elbow position changes that some. So any adjustments I make to my aim needs to be slight, because small adjustments make big changes in the ya hit. Big changes make huge changes in the flight path. The day-kai progressed well. I took pictures and was put on the scoring controls for the lights for a while. Part of my orientation to the “wa”. It was a good day at the dojo. Everyone enjoyed except for the cold. Everyone complained. 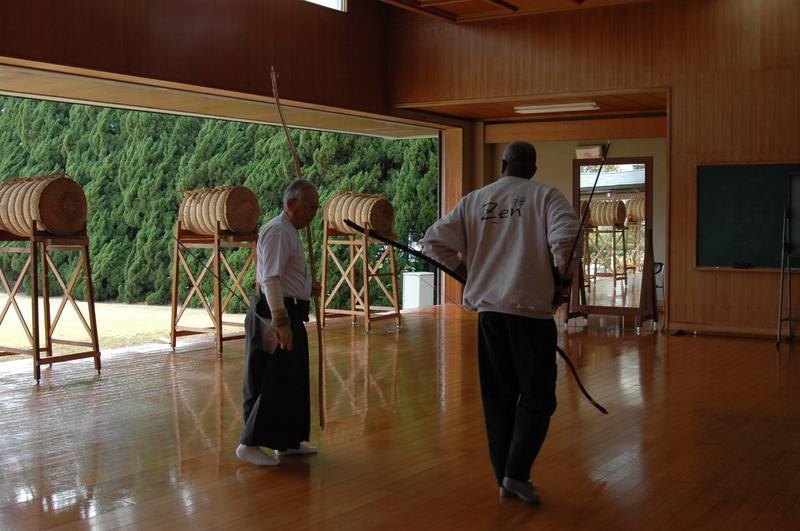 However I could not help think about what the Kaicho said the other day ” it is much worse at the other outside dojos”. 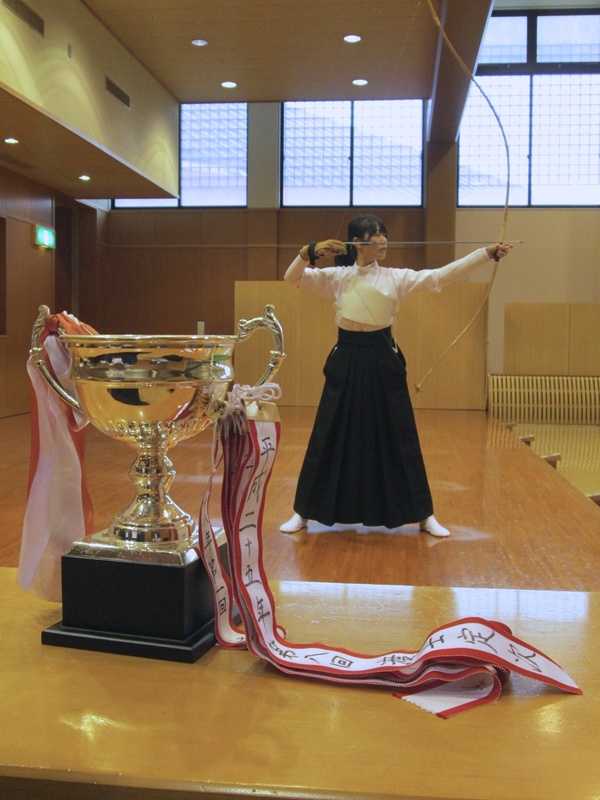 There are two more items on my Kyudo list for this year. 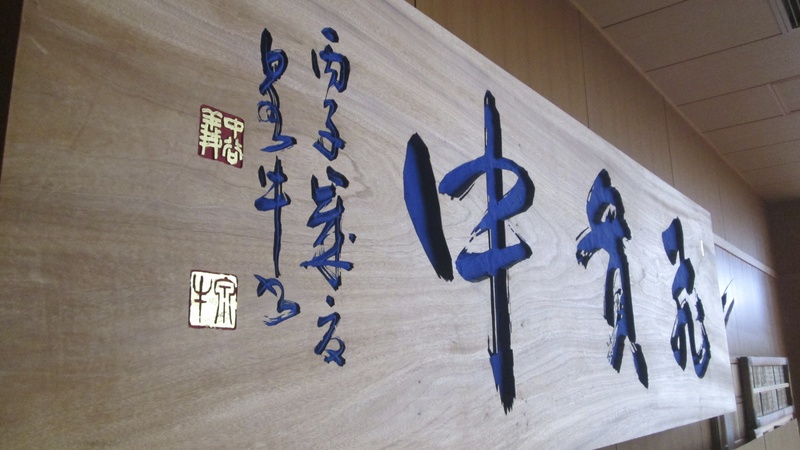 One is my pilgrimage to my old dojo this week, where I met Nogami Sensei. I will make this an annual event to honor my Sensei on the anniversary of his passing, I will go there to practice for the day. Lastly the Kishiwada Christmas, New Year’s party.